In both manufacturing and warehousing, workers are constantly challenged with minimizing floor space requirements while maximizing storage capacity. Typical solutions may include installing in a few extra racks at the end of a busy aisleway, double-stacking skids on already-filled shelves or narrowing aisleways to place more product on the floor. In doing so, they must still safely maneuver and coordinate a multitude of forklifts around blind corners, and across pedestrian walkways, and track storage locations, which are constantly changing due to lack of space and shuffling of skids in small spaces. This particular company was one of several located on Toyota’s supplier campus. They had been selected by Toyota to supply the foam seat cushions for the Tundra pickup truck. These foam seat cushions are produced through a molding process that involves a 90-minute cure time. During the cure time, the cushions must sit at room temperature with minimal handling to ensure a top quality product. The Toyota seat supplier needed a solution that would not only minimize handling during transport and curing but also store up to 2,600 parts during curing. In addition, since much of the floor space in the production facility was already allotted for other process machinery, there was very little space left for the curing and storage process. 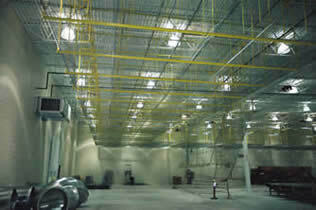 In many manufacturing environments, such as this one, the space below the ceiling trusses, light fixtures, piping and HVAC and above the floor machinery is unused. Since most operations are conducted on or close to the ground level, this vast amount of space is typically wasted. For this project, PACLINE supplied 2,200 feet of the PAC-LINE™ monorail conveyor with 740 custom-made parts carriers. 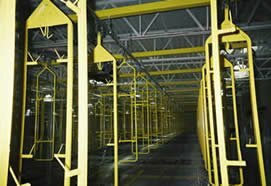 The conveyor was ceiling-hung to take advantage of the unused overhead space and was designed to transport parts from the foam machine to the next step in the process while providing the correct amount of curing time. Due to the limited floor space, the use of racks and increased forklift traffic were not an option and they would disrupt the flow of work far too much. Even if floor space for such racking had existed, such handling and increased forklift traffic would have required additional operators, creating a number of safety issues. With the minimum 90-minute curing time, the customer would have required multiple custom racks for storage and a system to track the curing time of each rack. The PACLINE overhead conveyor system allowed for FIFO (first in, first out) operation to ensure the cure time was met, without any special tracking method. Operators were able to focus on molding parts without worrying about handling, storage or transportation. PACLINE’s conveyor layout provided a compact product loading area at floor level. The conveyor then transported the foam cushions along a zig-zag path just below the ceiling, before bringing them back to floor level for unloading. As the entire conveyor was hung from the ceiling trusses, the floor was left completely free of support posts or any other obstacles. Approximately 400 square feet of space was employed for a small loading area, as well as an extended unloading area that supplied parts to multiple operators. Had only one unload operator been required, the floor space requirement could have been reduced to only 100 square feet. As the building had been newly constructed, PACLINE was able to install their modular, bolt-together overhead conveyor quickly, prior to floor machinery being installed. The floor machinery contractors were able to install their equipment unhindered by the ceiling-hung conveyor mounted above them. PACLINE was able to meet all of the needs of the seat manufacturer with their PAC-LINE™ enclosed track conveyor system which was ceiling-mounted and designed to handle 2,600 parts with only 400 square feet of floor space! The system was successfully installed – on time and under budget – and fully adhered to both the seat supplier and Toyota’s stringent requirements and codes.